Nameplates – The Manchester Rubber Stamp Co. Ltd.
Engraved nameplates add a touch of class or professionalism to your business or property. Below are a selection of engraved house nameplates in a variety of materials including; stainless steel, brass, aluminium, traffolyte etc. When required they come complete with wooden plinth and dome head screw fittings. 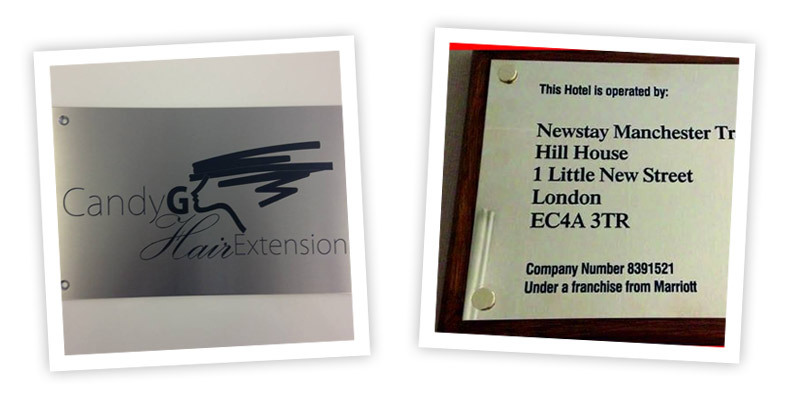 For corporate nameplates we can include company logo’s. We except most file formats. We have over 5000 true type fonts in our own font library, or send us your own via e-mail. Engraving nameplates is a speciality of ours with over 100 years of engraving experience between us. We have the full array of Engraving machines including Manual pantograph engravers, CNC Engravers and Laser Engraving Machines.